We’ve made it easy to invest in your home, and we’ll help safeguard your investment for years to come. Thomas Jefferson once said, “Never put off for tomorrow, what you can do today.” Thompson Creek® financing options are designed to help you get started on your home renovation project sooner, rather than later. We stand behind the home remodeling products we offer. 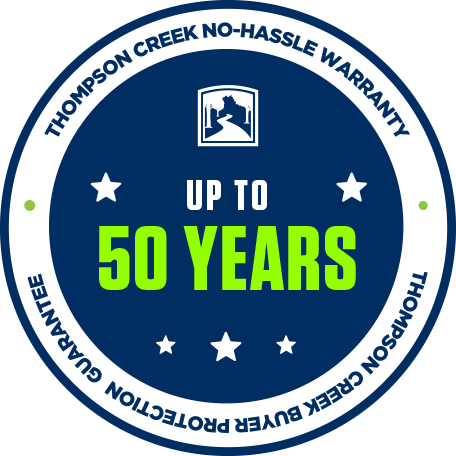 When you choose Thompson Creek, you’re getting more than just a contractor – you’re getting a partner for decades to come. You’ll never have to worry about doing that project again – even if your glass gets smashed by a rock or a baseball. Our Buyer Protection Guarantee and our No-Hassle Warranty are both designed to safeguard your investment from project start to up to 50 years after completion. If you decide to sell your home during our warranty period, you may be able to transfer your warranty to the new homeowner. Please feel free to read more about our Buyer Protection Guarantee and our No-Hassle Warranties on their respective pages.